As part of an extensive renovation, the St. Mary’s Care Center of Winsted, Minnesota recently constructed the Garden House Alzheimer’s unit. 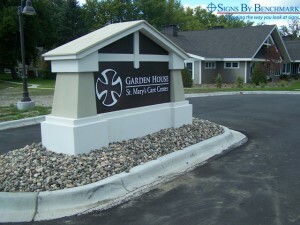 Wanting signage that would portray the warm, homey atmosphere of the center, St. Mary’s personnel called Herald Journal Sign & Graphics of Winsted, Minnesota. 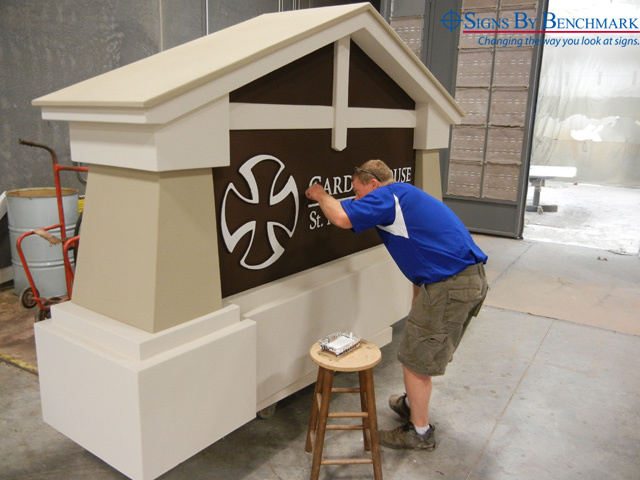 Having worked with Signs By Benchmarkon two other sign projects, Troy Feltmann of Herald Journal wasted no time setting up a collaboration. Mindful of his customer’s needs, Feltmann sent Signs By Benchmark designers an architectural rendering of the new building.Working from the rendering, the designers created the perfect custom monument sign. Featuring a three-color acrylic stucco finish, the double-sided 9′ x 6″ wide x 6′ 3″ high x 28″ deep mission style sign displays lettering coated directly into the sign face for seamless durability. Installation was a simple process. The Herald Journal installation crew members weren’t the only ones who appreciate the sign. 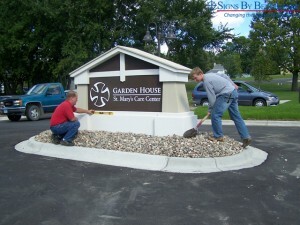 St. Mary’s Care Center is now another satisfied end user. Enjoy a successful collaboration with Signs By Benchmark that will produce complete satisfaction for you and your customers. Give its team a call at 800-658-3444 to discuss your next project.